Imagine that you are watching a great action movie. A strong-powered guy is on the scene and has just started chasing the bad guy, great tension in the air and you can see the bad guy starts sweat while he is running – everything looks great in the film as it should be, but something is missing. You can not feel the real feeling of the movie.. From silent comedies to modern blockbusters, cinema has always thrived on the thrill of the chase. Good music paints a mental picture of the suspense and thrill you might feel and fill all the missing parts of the emotions. And this time we’re here to get you excited with the MAXIMUS and we’re ready to take you on the top of the action and excitement! So hold your breath and start counting down – we are diving deep in MAXIMUS!! 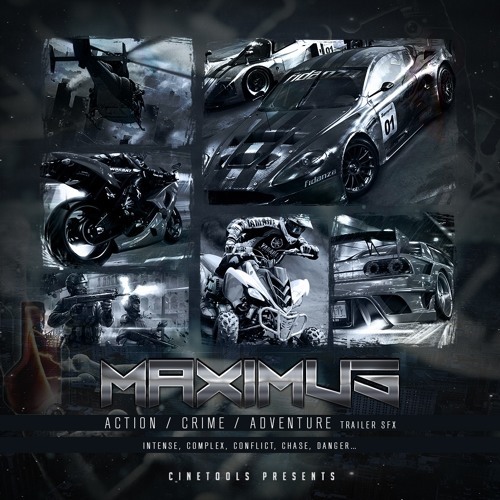 Cinetools present ‘Maximus’ featuring 853 cutting-edge cinematic sounds comes with suspenseful and energetic, aggressive and strong, dynamic and hard hitting, heavy and powerful trailer sounds with the amazing fusion of organic and electronic elements – full of drive and energy! It’s perfect tools for ramping up the intensity of your action-fused productions and good for setting up tension for any projects! An intense epic action melodics with driving pulses, orchestral energy, and big impacts, underscoring anything from a reckless helicopter chase to a battle between man and machine and any scene in which the bad guys are after the good guys.. Perfect for any scene that builds tension and eventually erupts! This library will add enough tension to your production and would work well in any chase and action scene. The variety of sounds featured in this adrenaline-charged library, includes everything to lead your productions to the victory; heavy brass, stabbing strings and thumping percussions, dark and ominous atmospheres and drones, thrilling soundscapes, hypnotically powerful rumbling sounds, complex and stunning ostinatos, dramatic pianos, twist and turns melodics, dynamic sweeps and whooshes, distorted mega braams, drastic synth-lines, synthetic and sequenced pulses, epic drums and intense booms, stutter downers, impacts, explosions, suspenseful rises, ear-squeezing stingers, epic markers.. All these sounds are made exclusively to provide cinematic lovers a truly diverse sonic palette for creating high definition cinematic projects also well suited in many other situations where film standard sound is required. You can use these sounds as they are or mix and match them with other elements from this collection to create your own ideas. AND as usual this furious library includes variety of RAW SOURCES and FIELD RECORDINGS such as car and van engines, a generator, rattles, screechs, household items, electrical doors, windows, washing machines, microwave and different shape of material sounds ie. metal, wood, plastic, bronze, aluminium etc.. all of these sounds combined with the multi mic positions and recorded with Rode NTG-3, Neumann TLM102, AKG C411PP, Zoom F8, Tascam DR100MK3 – All the sounds are perfectly categorized and labeled to make it easy for you to use them and ready to combine with the other sources and create your own unique cinematic sound effects in a short time. In detail expect to find 5.5GB of raw content including 853 powerful sound elements – consist of; 110 Atmospheres foldered as 34 Dark & Ominous, 22 Rumbles and 54 Tonal, 48 Braams, 161 Hits contains 35 Booms, 25 Drum Loops, 30 Drums & Percussions and 71 Hits, 75 Melodics divided into 20 Hard Synth Lines, 35 Ostinatos and 20 Pianos, 51 Pulses, 180 Transitions includes 30 Downers, 33 Markers, 25 Risers, 32 Stingers and 60 Whooshes, 228 Raw Sources & Field Recordings. All sounds are hyper-detailed, layered and manipulated they can easily be added to your projects. Every sound was originally recorded at 24 bit / 96kHz to ensure the highest quality for today’s cinematic production needs and were edited for instant use in your projects or creative processing. All of the samples have been pre-cleared and are 100% original & royalty-free for your use without any additional licensing fees. ‘Maximus’ will find its place in your library as an indispensable reference point for your next movie, trailer, game, documentary, advertising or any kind of cinematic and multimedia project. Perfect for high tension action-adventure productions, intense drama, crime & thriller projects, danger & reality shows, fighting – chasing – escaping scenes or situations of extreme danger of pressure. Also good for any motion design in need of an additional punch to it. And a great way to introduce a surprising violence. Intense, complex, conflict, chase, danger… these are just a few words to describe this stunning library!